New for March 2010! Professor Bharathi Bhat was one of the principal researchers in establishing the theory and application of finline. She literally wrote the book on finline! This page was writen with the help of Dr. S. Raghavan, the last Ph.D. scholar of Prof. B. Bhat and a Senior Professor, National Institute of Technology, Trichirappalli, India. Thanks! Finline is similar to slotline, but the finline structure is bounded within a rectangular waveguide. It solves the problem of how to install components such as diodes into rectangular waveguide. It is a close relative of double-ridged waveguide. Finline was first proposed by Meier in 1972, and ideally suited for use in millimeter frequency applications. It can be used from 30 GHz to 110 GHz. Basically it consists of a partially metalized dielectric substrate shielded by a rectangular metal enclosure. 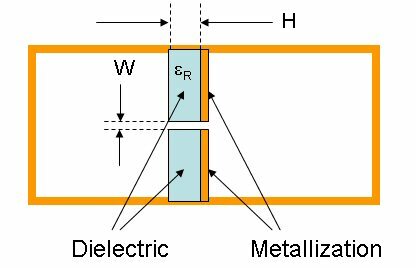 The metallization can be in the form of fins and/or isolated strip conductors of arbitrary widths placed in symmetric or antisymmetric positions on the substrate. The types of finline include unilateral finline (fins on only one side of the substrate with slot in the centre or off-centered) symmetrical and asymmetrical, bilateral finline (fins located on both sides of substrate, broadside coupled double-dielectric finlines employing two symmetrically positioned substrates with an intervening air gap between them), asymmetric broad side coupled double dielectric finline, edge coupled finline, antipodal finline and insulated finline. Antipodal finline is useful to act as transitions between two kinds of planar transmission lines. The useful applications are filters, hybrid rings, power dividers, phase shifters, mixers and transitions. Finline got its name because it resembles a fin of a fish. This is the only structure having planar transmission line in E-plane inserted in a waveguide. These kind of quasi-planar structures combine the advantageous features of planar technology in terms of amenability to circuit integration and mass production, and of waveguide technology in terms of low loss. The characteristic impedance (Z0) range that can be realized in finline spans 10 to 400 ohms, which is much greater than what is practical in microstrip or stripline. The dominant mode of propagation is a hybrid mode. Commonly used substrates include RT-Duroid, Cuflon and Kapton. An exhaustive analysis of finline is reported in B. Bhat and S. K. Koul, Analysis, Design and Application of Finlines, Artech House, MA 1987.